It's such a wee little system. When unboxing the system that Black Friday morning, a friend of mine asked, “Is that really the whole system?” It was hard to believe a brand new console could be the size of a couple DVD cases. The whole system was lighter than the Xbox 360’s power brick alone. Even the TV remote-style controller seemed lost in the palm of my hand. 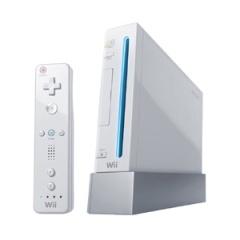 While a compact console isn’t exactly groundbreaking innovation, it did make the Wii an easier fit in any entertainment setup and easily transported to gaming gatherings. The Gamecube had a handle, but the Wii was a truly portable console. After first hooking up my Wii that cold November morning, my first software boot wasn’t Twilight Princess, Excite Truck, or even Wii Sports. It was the Mii Channel, where I spent almost an hour putting together bobble-headed representations of the friends present. Mii mania leveled off before long, but Microsoft and Sony ripped off the avatars anyway. With the New Xbox Experience came Avatars that clumsily juggled cartoony roundness with more realistic body proportions and an initial lack of purpose. But at least they weren’t the bomb that PlayStation Home and its uncanny valley mannequins turned out to be. It seems Nintendo’s less-is-more Miis might have been the right approach: without defined arms and legs, Miis were infinitely adaptable and basic enough to excuse the limited customization options. Its Friend Code online IDs were atrocious. Nintendo wasn't keen on its family-friendly image being sullied by online gaming's symphony of expletives, so it took every measure it could to keep players from exposing each other to crude discourse online. Rather than letting players create a system-wide moniker like its competition did, Nintendo assigned each Wii a 16-digit numeric Friend Code: the only way to play online with someone was to exchange and register each other's Friend Code. Doing it once on the Wii Message Board to exchange text messages was bad enough, but every single game had its own assigned Friend Code. If Greg and I wanted to play Super Smash Bros. Brawl, Mario Kart Wii, and Tatsunoko vs. Capcom with each other online, we would have to exchange a separate 16-digit friend code for each game. It was a clumsy and needlessly time-consuming method of friend registry, and it was universally reviled. Nintendo has recently announced that Wii U will not have Friend Codes. And there was much rejoicing. Store shelves were full of Wii accessories. Most were empty plastic. Peripherals jumped onboard the Wii hype machine early, showing up on store shelves at launch with baseball, tennis, and golf attachments. Despite serving no purpose and often hindering gameplay by blocking the controller’s infrared camera, this cheap crap must have sold pretty well because gun attachments, steering wheels, and controller decals often occupied more shelf space than actual Wii games. Nintendo themselves were little better, bundling Mario Kart Wii with a pointless wheel and Link’s Crossbow Training with a plastic contortion of a rifle, blasphemously named the Zapper. Its actual peripherals barely got used anyway. It was the clumsy beta to Wii U's "TVii" feature. PlayStation 3 had the Cross-Media Bar, Xbox 360 had its Dashboard Blades, and Wii had...Channels. Though many used the Wii menu much like the array of apps seen on all modern smartphones, you could actually use the + and - buttons to flip through them like, you guessed it, TV channels. Nintendo bigwigs expressed their desire for people to use the Wii like a television, flipping through useful channels between gaming sessions. They started by introducing news and weather channels soon after launch, eventually ending up with a suite of quirky but clunky internet features. Considering the promising previews of Wii U’s TVii, the original Wii’s Channels show that Nintendo is ever the paradox, both behind the times and ahead of the curve. Some of its weird Channels were fun anyway. 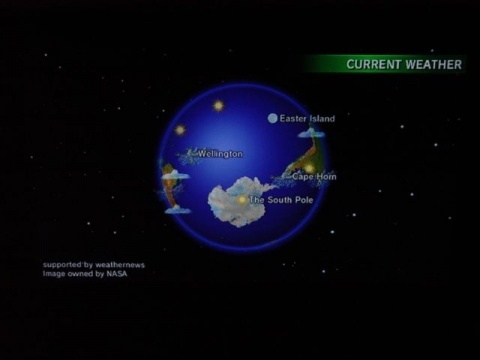 Though booting the Wii and checking the Forecast Channel was a lengthier process than doing the same on my computer, phone, or even TV, I’d still check it out now and then just to spin the globe with the Wii remote for kicks. The Nintendo Channel provided some interesting gameplay stats from both personal and global views, and it even let you download Nintendo DS demos to your portable system. The Check Mii Out Channel was a treasure trove of downloadable Miis, including movie stars, favorite characters, and even bizarre Mii face art. My personal favorite, though was the Everybody Votes Channel, a fairly simple collection of binary polls (“Dogs vs Cats,” “Lefty vs. Righty,” etc.) that nonetheless kept me coming back every few days for over a year. Add in a passable web browser, Netflix and Hulu Channels, and oddities like the Metroid Prime 3 Preview Channel, and it’s easy to see Nintendo was going for a full entertainment center even on the severely limited Wii hardware. It had so little storage, Nintendo likened space management to "cleaning out the fridge." The OS and Channels were oddly charming and evocative. There’s just something comfortable about all those Wii channels. The Wii Shop Channel’s lazy Muzak and barren, eggshell storefront brings back memories of buying trinkets at bargain bin stores. Pinching my friends in the Mii Channel and watching their little flailing limbs as I dragged them around the screen was a sick pleasure. Wii Message Board notes sometimes took over 24 hours to reach a friend online, but the attachable Mii pics and stationery style added a personal touch. And all the little musical intros to each channel and game were just precious. While the PlayStation 3 and Xbox 360 operating systems went for slick utilitarian silence, even the darkest corners of Wii’s options menus had an almost ethereal electronic humming. Wii may not have had its competitors’ feature sets, and the comparable services it offered were of a lesser caliber, but the runt of the litter certainly had character in spades. For all its baffling feature omissions and chronic shortcomings, Wii still had a substantial (if quite odd) feature set. Did you ever use Wii's complementary channels, or was it strictly a game system? Join the discussion in the comments and check back each day this week for more of our look back at Wii's six-year life.